This is part of a series on Cocktail Science. Read part one, The Theory of Natural Cocktail Selection, part two, On Shaken Cocktails, and part three, The Cocktail Development Model. I could spend the rest of my life drinking nothing but five classic cocktails and never get bored. The reason, as I’ve previously discussed, is that technique and the freshness of ingredients often matter more than fancy spirits and how many. People get this wrong all the time. I’ll trade a bunch of expensive spirits for a skilled hand and citrus squeezed a la minute any day of the week. But kids these days want novelty and exotic flavors. While you can certainly go out and stock your bar at considerable expense (which I have done, for the record), there are other ways to bring some (thoughtful) novelty to your cocktails. Culinary ingredients, including fresh aromatics and juices, are the perfect way to do this. As it turns out, your grocery store has plenty of delicious things to include in your cocktails. You just need to know how to go about it. The main problem is we have delicious ingredients like lemongrass, for example, that may beautifully compliment our cocktails, but nonetheless are complicated to work with. Essentially, there is a bit of a form factor dilemma: We can’t easily squeeze the juices out of dense and dry lemongrass the way we can with juicy limes. Instead, we have to slowly coax out the essential oils from ingredients like lemongrass into some other medium, for example, water or ethanol. Normally in cocktailing, we’d just muddle an ingredient when we wanted to flavor our cocktail with it, but lemongrass, firm and fibrous, doesn’t really lend itself to muddling very well. It just needs more time to extract than the minute or so it takes to make a cocktail. So, we have to employ other methods to infuse the flavors from these kinds of ingredients. I’ll overview each of these cocktails and, at a high level, the technique required to produce them. The Hammer & Nail is a play off the quasi-classic Screwdriver cocktail, the latter of which consists of one part vodka and two parts grocery store carton orange juice. It’s pretty gross, if you have been unfortunate enough to have never tried it. My version, however, is light, flavor intensive and delicious. It can also be made with nothing more than some vodka, an orange and lime, along with a bit of sea salt. True, this is more than just vodka and orange juice, but it’s not all that much more. The key to this cocktail is taking fresh squeezed orange juice, adding ethanol to it along with a small quantity of other things so that, in the end (if made properly), will basically still tastes like delicious, fresh squeezed and vibrant orange juice. The key to diluting orange juice with vodka and yet still maintaining a juicy orange taste is adding a bit of lime for acid, sugar for sweetness and extracting the essential oils from grated orange peel for additional flavor concentration. The trick, though, is to lightly grate the orange peel and allow the essential oils to infuse the drink a la minute. The results can be remarkable. The most important part of this cocktail is the orange. I recommend navel oranges of a small size but heavy relative to that size, uneven color tone across the fruit ranging from deep orange at the center to green yellow at the ends, with a bright orange aroma at the navel. Remember that subpar fruit make for subpar cocktails. The name is a play on the old Screwdriver cocktail, along with the saying, “If all you have is a hammer, everything starts looking like a nail.” The cocktail intends to show, when you have good technique, even vodka and some citrus fruit can be good cocktailing. This cocktail is an obvious play on the classic daiquiri, only piling on the aromatics. Those aromatics include a lemongrass syrup with not only lemongrass, but also ginger and coriander seed to round it out. Also, to brighten things up a but, I also utilize grated lime zest and torn Thai holy basil. Although the extraction of flavors from lime zest and basil occur a la minute in a similar fashion to the Hammer & Nail, creating the lemongrass syrup is actually a bit more complicated and requires more than just lemongrass. Lemongrass itself smells and tastes like lemon-fresh floor cleanser. It has an edge to it when tasted alone and raw that makes it somewhat unpleasant. To balance, mellow and add complexity to this flavor, you need to do two things: Apply heat and add subtle layers of other flavors. I’ve found that small amounts of ginger and freshly ground coriander seed add just the right nuance (under temperature) to get a more palatable flavor in the syrup. Ultimately, the syrup still tastes like lemongrass, just a more tasty and nuanced version of it. The Kentucky Fedora is a play on the bourbon base of the cocktail. Compounded in this is also a reference to the Derby, which is both a style of hat and a native Kentucky horse race event that makes ample use of bourbon. Then there is the Fedora, which, with the inclusion of espresso in this cocktail, makes light of the Italian alternative to the Derby hat. This cocktail is the result of running a classic eggless whiskey sour (a shaken combination of bourbon, lemon juice and simple syrup) through my cocktail development model to pull out a recipe that can tolerate a higher degree of dilution than the classic recipe. 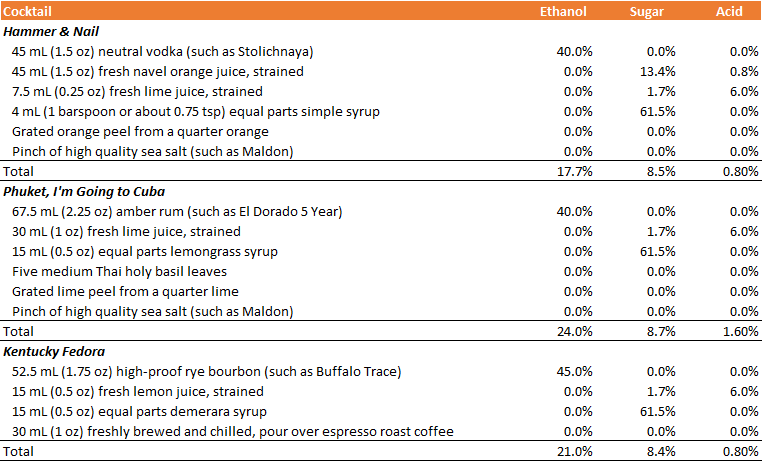 As it turns out, you can tweak the proportions of just about any classic cocktail (on the basis of my statistical modeling) to keep it tasting balanced and delicious, but nonetheless include in the cocktail as much as a third proportion of water. Why bother doing this? Well, the dilution can be used to add, not water, but some chilled Italian espresso (which is the Italian fedora side of the recipe). The results are quite stunning. See my article concerning cocktailing background, necessary equipment and technique as a preface to the following recipes. Combine water and sugar in a medium sauce pan and place over medium heat, stirring continuously. Do not allow liquid to even mildly simmer at the edge of the pan. If any simmering starts, remove from heat and continue stirring. When sugar is fully dissolved and syrup is entirely clear, about three minutes, pour into bottle and refrigerate for at least two hours before use. In a medium saucepan, bring water to a boil over high heat. While water is heating, add lemongrass, ginger, coriander and vodka to a blender. Let sit. When water begins to boil, removed saucepan from heat and add water to the blender. Set saucepan aside. Pulse blender until solids are the consistency of fine fibers. Add all of the contents of the blender back into the saucepan and bring to a light simmer over medium heat. Simmer until reduced to about three-quarters of the original amount, about seven minutes. Into a clean container, pour all of the contents of the saucepan through a fine mesh conical strainer. Be sure to press the solids firmly to remove all of the liquid from the remaining solids. Reserve the infused liquid and discard the solids. Combine infused liquid and sugar in a clean medium saucepan and place over medium heat, stirring continuously. Do not allow liquid to even mildly simmer at the edge of the pan. If any simmering starts, remove from heat and continue stirring. When sugar is fully dissolved, about five minutes, pour into bottle and refrigerate for at least two hours before use. Using a balanced flavor, non-bitter variety of whole bean espresso roast coffee, grind using a burr grinder to the consistency of kosher salt. Set up your hand pour over brewing method of choice. I recommend Chemex as it has a thicker filter, which minimizes bitterness. Brew coffee per the instructions provided by your brewing equipment. If using Chemex, use the following instructions but substitute the above amounts of coffee and water for those specified in the instructions. Similarly, use the above amounts for any hand pour over brewing method. If using a more typical drip coffee maker, use the instructions specified by the manufacturer, except double the amount of coffee specified to brew 250 mL of coffee. Pour the coffee into a bottle, preferably with a vacuum seal, and refrigerate for at least two hours before use. Choose a cocktail. Juice citrus as appropriate, be sure to have chilled syrup and/or coffee on hand, as applicable, and chill your glass in the freezer for at least 30 minutes before serving. Place all of the ingredients in front of you along with your shaker and jigger. With the jigger, precisely measure off all ingredients and build the cocktail within the shaker. If using large cubes of ice, place two cubes in the shaker. If using other ice, fill the shaker with ice. Seal the shaker. Holding the shaker horizontally, shake the cocktail with reasonable vigor and speed but without straining yourself, moving the contents of the shaker from front to back. Continuously shake for 12 to 15 seconds with large cubes and about 10 seconds with smaller cubes. Retrieve your glass. Holding back the ice with a primary strainer if using a cobbler shaker (or other method if using another shaker), strain through the fine mesh conical strainer into the chilled glass. Garnish as appropriate and serve immediately. Have a question? Ask me anything! What a great series, and great cocktail recipes! Definitely ones to try at home. Thanks for the kind words, Mairi! I took a look at a number of your recipes and beautiful pictures as well. They look very interesting and I’m looking forward to reading more. Wonderful to meet you!